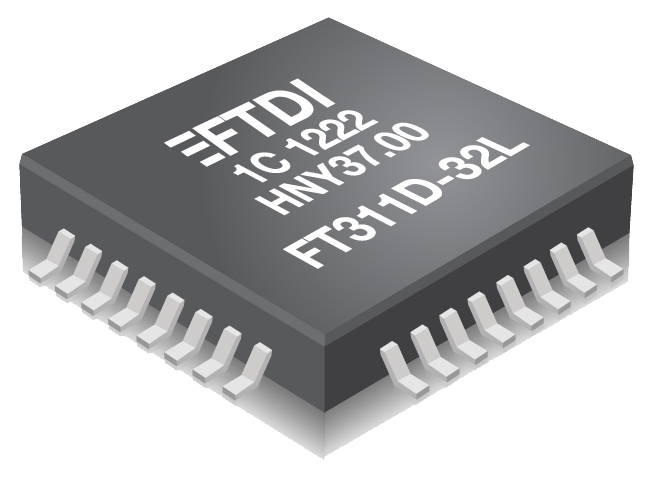 The FT311D provides a bridge between peripheral hardware and an Android platform with a USB device port. The FT311D will enumerate the Android platform and provide an interface to either, GPIO, UART, PWM, I2C Master, SPI Slave or SPI Master. Note, proper compatibility requires Android Open Accessory Mode, available in Android platforms 3.1 onwards. Hardware selectable interfaces - GPIO, UART, PWM, I2C Master, SPI Slave or SPI Master. Single power supply operation at 3.3V. Internal memory for storing configurable strings – allows Android to automatically detect the device and application.